Do men and women see differently? Take this test to find out! Whatever you do, don't click this link! A reader from Chelmsford, in Essex, has kindly sent us the following page from the East Anglian Daily Times. Utterpants are proud to publish this uplifting tribute to the warm regard in which US President, George W Bush, is held by the grateful people of the United Kingdom. 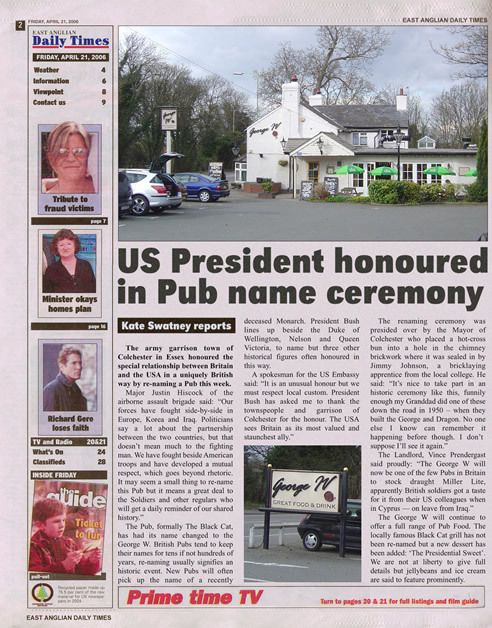 Our researcher has discovered this is only the second time in British history that a Pub has been named after the leader of a foreign nation. The last occasion was in 1588, when the Pig and Whistle, in Cheapside, in London, was re-named 'The Duke of Parma' in honour of the humanitarian liberator of the Netherlands. The army garrison town of Colchester in Essex honoured the special relationship between Britain and the USA in a uniquely British way by re-naming a Pub this week. Major Justin Hiscock of the airborne assault brigade said: "Our forces have fought side-by-side in Europe, Korea and Iraq. Politicians say a lot about the partnership between the two countries, but that doesn’t mean much to the fighting man. We have fought beside American troops and have developed a mutual respect, which goes beyond rhetoric. It may seem a small thing to re-name this Pub but it means a great deal to the Soldiers and other regulars who will get a daily reminder of our shared history." The Pub, formally The Black Cat, has had its name changed to the George W. British Pubs tend to keep their names for tens if not hundreds of years, re-naming usually signifies an historic event. New Pubs will often pick up the name of a recently deceased Monarch. President Bush lines up beside the Duke of Wellington, Nelson and Queen Victoria, to name but three other historical figures often honoured in this way. A spokesman for the US Embassy said: "It is an unusual honour but we must respect local custom. President Bush has asked me to thank the townspeople and garrison of Colchester for the honour. The USA sees Britain as its most valued and staunchest ally." The renaming ceremony was presided over by the Mayor of Colchester who placed a hot-cross bun into a hole in the chimney brickwork where it was sealed in by Jimmy Johnson, a bricklaying apprentice from the local college. He said: "It’s nice to take part in an historic ceremony like this, funnily enough my Granddad did one of these down the road in 1950 – when they built the George and Dragon. No one else I know can remember it happening before though. I don’t suppose I’ll see it again." The Landlord, Vince Prendergast said proudly: "The George W will now be one of the few Pubs in Britain to stock draught Miller Lite, apparently British soldiers got a taste for it from their US colleagues when in Cyprus — on leave from Iraq." The George W will continue to offer a full range of Pub Food. The locally famous Black Cat grill has not been re-named but a new dessert has been added: ‘The Presidential Sweet.' We are not at liberty to give full details but jellybeans and ice cream are said to feature prominently.